Here is a little ditty I found regarding Navigation Bar entries in Apex and had a minute to investigate how/why, so I thought I'd share. When you attempt to set the master navigation bar entry in your application, you need to use a search dialog to select the relevant navigation bar entry from a list of the applications within your workspace. Unfortunately, the list of entries is sometimes without a descriptive label. So I thought I'd have a look to see what attribute is being displayed in the dialog. It turns out the dialog uses the Image ALT text, not the entry label. So when you create/edit your navigation bar entries, I suggest make it a habit to set this attribute also - it may make your life easier in future. Particularly I guess if you ultimately move towards a different template for your navigation bar entries. 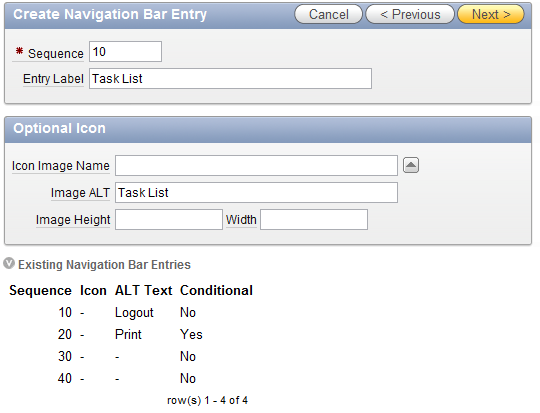 Even the context help showing existing navigation bar entries uses the ALT text as its descriptive term.